Dwayne “The Rock” Johnson has wowed us before, and he’s about to do it again — and again, and again, and again, with upcoming releases Jumanji, Baywatch and The Fate of the Furious. Dolce catches up with the beloved tough guy before he tackles his next challenge. As Helen of Troy’s face is supposed to have launched a thousand ships, one could easily say that Dwayne Johnson’s famed raised eyebrow launched hundreds of media appearances, wrestling matches and movie roles. 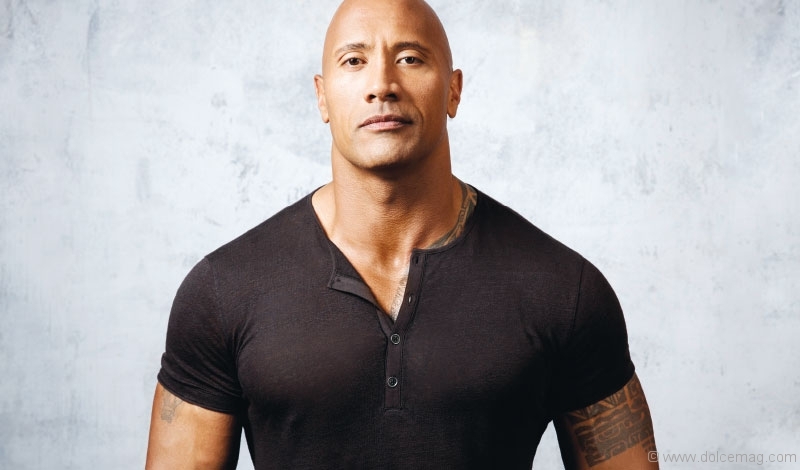 As the son of a pro wrestler, Johnson’s wrestling career as “The Rock” was an instant success, and his tongue-in-cheek personality is a big hit with the fans.More than any of his peers, he’s always had this ability to break the fourth wall and connect directly with the audience. But Dwayne Johnson’s acting success didn’t come overnight. Taking acting lessons, steadily working his way up to bigger parts, sometimes playing against type, he started getting noticed in movies like The Mummy, The Scorpion King and The Rundown. Action, comedy, drama, children’s movies — Johnson seems to not have any limitations, making him not only the natural heir to classic action stars like Arnold Schwarzenegger and Sylvester Stallone, but an all-around solid actor with great range. He even returned to wrestling in 2011 and met the same success he had 10 years prior. Cue 2017. Johnson is now one of the world’s most in-demand A-list stars and has almost 80 million followers on Instagram. Last year, he and longtime girlfriend welcomed their second daughter, and this year is poised to be another banner year for him. 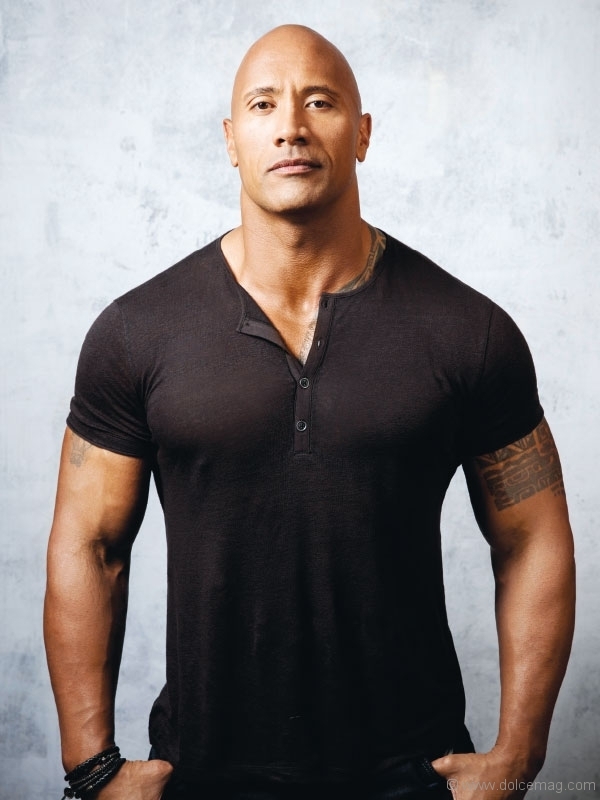 He stars in two back-to-back movies this spring, first a big screen adaptation of the cult 90s TV show Baywatch, and then the 8th installment of The Fast and The Furious franchise, in which he reprises his role as Luke Hobbs. He will end the year by starring in the remake of Jumanji. Can you smell what Dwayne Johnson is cooking? It’s smelling very good! DOLCE MAGAZINE: Dwayne, you’re at the pinnacle of your career these days. You’re not only the top-paid actor in the business but you’re also The Sexiest Man Alive? 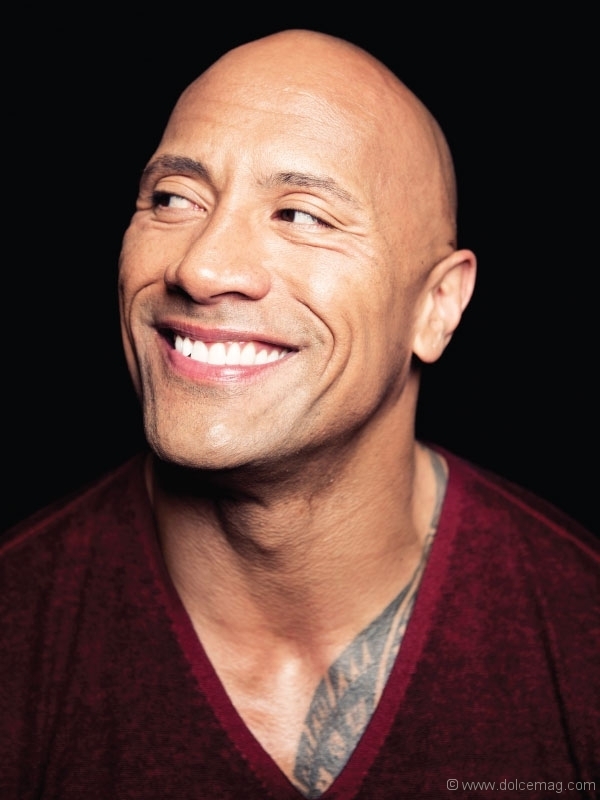 DWAYNE JOHNSON: [Laughs] It’s exciting and it’s very gratifying. But anything I’ve accomplished is the result of having great self-belief and determination to succeed in life. I had to pick myself up off the floor and work very hard to make my way back in life. Trying to find work in Hollywood, I had that scratch-and-claw mentality where you just keep pushing and fighting until you get one job, then the next, and keep moving forward. I hope a lot of people can look at my life and see that hard work and ambition can take you a long way. DM: You’re getting work on all kinds of movies these days. You did an action comedy with Kevin Hart [Central Intelligence], you voiced an animated character in Moana and now you have The Fast and The Furious and Baywatch coming up. DJ: I always believed that I needed to do all kinds of movies including comedies and family films and not just action movies if I wanted to grow as an actor. I’m also very comfortable doing comedy because I love to laugh and [making] other people laugh. I think it’s important to have a healthy spirit and I want to be able to share my spirit and enthusiasm with everyone. DM: You often visit children in hospitals or lend your support to children’s charities. Was your love of children one of the reasons that made you want to do Moana? DJ: I’ve done family films before and this one was very special. It was great to work with the people at Disney [which produced Moana] and be part of a movie that children and families can enjoy. I also embrace the aloha spirit that is part of the film and which is very meaningful to me and to Polynesian culture. Whenever I go to Hawaii or other islands in the Pacific I always feel the energy of those places, and a movie set in that world resonates very deeply with me. It’s my culture, and while I was working on it the grandmother in the film is very much like my own grandmother. That really touched me, and I can tell you that never in my entire career have I ever cried as much as I did making Moana. It was a very special experience. DM: You went through some difficult times growing up in Hawaii. Are there still some sad memories attached to your life there? DJ: It was tough for me and for my family. I had a lot of personal struggles I was going through and I was lost and getting into lots of trouble as a teenager. I needed to straighten myself out and thanks to bodybuilding I was able to gain self-respect and set definite goals in my life. I tried to model myself after Arnold Schwarzenegger and Sylvester Stallone and I knew that one day I would get into acting. DM: Were you bullied in school yourself? DJ: Oh, yeah! I was bullied a lot when I was in junior high school and I know how terrible that can be and how it ruins your self-esteem. You need to be able to reach out to people who are going to be able to do something to make sure that the bullying stops. Most kids don’t have the gumption or physical capability to stand up to bullies. It’s very destructive and degrading and no one should be subjected to that because it’s going to leave scars that are hard to erase. You can’t just hold it all in, the humiliation and fear, you’ve got to be able to communicate with your teachers, your counselors, your principal, your brothers and sisters, your parents. Your high school years are very defining and it’s important for kids to be able to develop into who they are without the kind of stress and psychological damage that bullying can cause. DM: You are also very proud of your Polynesian heritage. You have a noble title, don’t you? DJ: Yes. I’m a High Chief in Samoa. That’s the highest title you can have bestowed on you by the king. It was a very big day for me, the most meaningful moment in my life, second to the birth of my daughter. Fifty thousand people were gathered for the ceremony, which was very long and very spiritual. It was an amazing day and experience for me. DM: You have some tattoos that relate to your heritage as well. DJ: Tattoos are very meaningful in Polynesian culture. Tattooing is a rite of passage. It’s spiritual. It tells a story. Symbolically these are stories that have been around for thousands of years. They tell a story of one’s life. And my tattoos tell the story of who I am and my journey in life. DM: How did you develop the kind of life skills that enabled you to succeed in life and which might be a lesson for others to follow? DJ: The worst time in my life came after I was finished as a pro football player. That had always been my dream and suddenly the dream was over and I was left feeling empty and devastated. I was lying on my sofa crying. I didn’t want to do anything or see anyone. But I had some good friends who helped pull me out of that and at one point I decided to stop feeling sorry for myself and find a new dream. I turned to bodybuilding because that was something I knew I could do and enjoyed the feeling that training gave me. That led to me into wrestling where I was able to use some of my natural charisma and all the emotions that I was used to bottling up inside me. DM: You seem to be very open and engaging as an individual. Have you always had that kind of outgoing, larger-than-life spirit? DJ: Thank you for saying that, first. I always had that inside me, I think, but it took me a long time and a lot of ups and downs to bring me to the point where I was able to communicate my emotions. I went through a lot of turmoil and suffering until I learned how to better communicate my thoughts and deepest feelings. I learned how to express my emotions, I learned how to listen and interact with others, and that was the most important change I made in my life. I’ve felt so much better ever since and it made a huge difference in my career and in my personal relationships. DM: You exude a lot of confidence and enthusiasm. But there’s also a sense that you must have developed a certain level of mental toughness to get to where you wanted to go in life. DJ: One of the great things that I have in common with Kevin [Hart] is that we had to learn to scratch and claw in life. He was working his way up the comedy circuit and I used wrestling to make a name for myself and get into the film business. That mentality comes through when you’re trying to make a transition to Hollywood. You get a rejection — a studio or a network says, “No, we don’t like your show, go pitch it to someone else,” or “You’re not right for this role, we’re going to give it to this other guy.” That mentality is still there. DM: You learned a lot about the art of performing during your wrestling glory days in the WWE. Were you always thinking about conquering Hollywood at some point? DJ: It was always my dream to be an actor. Watching Rocky changed my life and that character became my role model. I got into wrestling because that was a family tradition and that it would be a good way of making a name for myself that one day could lead to Hollywood. I actually developed my own Hercules project long before I actually got to play in the film but no one took me seriously. I had to slowly, very slowly, work my way into the business doing films like The Mummy Returns and The Scorpion King and even after that it was very hard for me to get parts. I made it a point to learn everything about how the business works and do whatever it takes to succeed. So I tried doing comedies like Be Cool and Get Smart because comedy came naturally to me and I knew I was good at it. DM: Do you ever miss your wrestling days when you would appear before massive crowds or is acting a much easier way to earn a living? DJ: Wrestling in front of a live audience is an extraordinary feeling. You feel such an incredible energy when you’re in the ring. It takes a physical toll on you, but it’s incredibly exciting. Acting is very different, of course. You need to be able to show a wide range of emotions and create many different kinds of characters as opposed to one. Up on the screen, I get to fall in love, be funny or be very dramatic. When you’re in the ring, the beating you put on your opponent is the only thing that counts. [Laughs]. DM: You have two children [Jasmine, 1, from long-time girlfriend Lauren Hashian and 15-year-old Simone, from his first wife, Dany Garcia, who still works as his manager]. How have you evolved as a man and a father over the years? DJ: I think it takes time for guys to figure out who they are and what kind of life they want. Gradually you realize, “Oh, this is who I am. This is who I’m comfortable being,” and you begin checking off all those boxes about what you’ve dreamed about achieving and that gives you more confidence. And as you get older, you find that there are more boxes out there and more goals that you set for yourself. DM: What is the most important advice you can offer to your children? DJ: The number one thing is to have confidence in yourself. You need to believe that you are good enough and that you can accomplish what you set your mind to do. You’ve also got to learn how to block out all the noise and all the things that distract you from your dreams and ambitions. You’ve got to listen to that little voice inside you that tells you that you’re good enough and that you can realize your dreams.